Andrew Mills, one of the four members of the strong Team Skandia GBR in the Finn class took the only race sailed today by a comfortable margin over his competitors. Meanwhile, team mates Mark Andrews, Ed Wright and John Tremlett collected top scores after a premature start. In second place overall yesterday, Giles Scott managed an average race scoring 14 points, dropping to 4th overall. 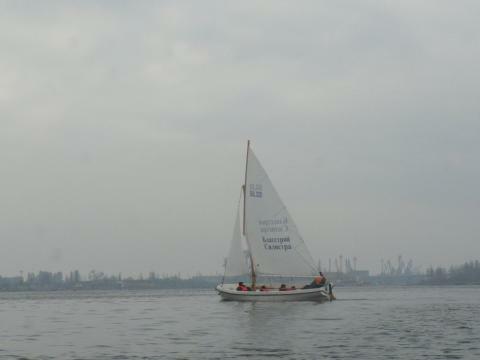 Race 3 started with a ten knot northerly breeze on the third start. Andrew Mills started close to the pin end chose the left side, along the coast looking for more pressure. His move paid off when he reached the top mark with a big lead over the rest of the fleet. Only Mark Andrews (GBR) was on his tail, but was soon signalled OCS by the racing committee. “I gained more ground on the first run” explained Mills, who rounded the bottom mark 40 seconds ahead of Tapio Nirkko (FIN). “On the second beat I covered the fleet but still had a decent lead. I lost some advance on the last run with the dying breeze”. This is the first victory in a Finn major event for Mills, who has won a race in each of the Sailing World Cup event he participated in this year! Today’s victory places Mills in third overall. Tapio Nirkko (FIN) took the second place in the race and the overall results, five points from Gaspic. After an hour wait for the second race of the day, the racing committee decided to cancel racing for the day. “We had some readings as low as 2 knots on the area and shifts up to 40 degrees. The forecast didn’t seem to predict more wind later, so we decided to abandon racing for the day”explained PRO Peter Reggio.